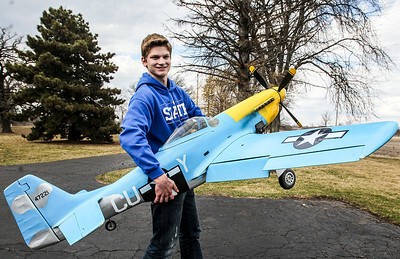 Sarah Nader- snader@shawmedia.com Marengo's all-star baseball player, Adam Rogutich, 18, of Union, poses for a portrait with one of his radio-controlled planes outside his home on Tuesday, April 8, 2014. Rogutich has his pilot's license and will be going to Indiana State for their aviation program in the fall. Sarah Nader- snader@shawmedia.com Marengo's all-star baseball player, Adam Rogutich, 18, of Union, practices on a flight simulator at his home on Tuesday, April 8, 2014. Rogutich has his pilot's license and will be going to Indiana State for their aviation program in the fall. He practices on the simulator three times a week and have 90.5 hours in the air. Marengo's all-star baseball player, Adam Rogutich, 18, of Union, practices on a flight simulator at his home on Tuesday, April 8, 2014. Rogutich has his pilot's license and will be going to Indiana State for their aviation program in the fall. 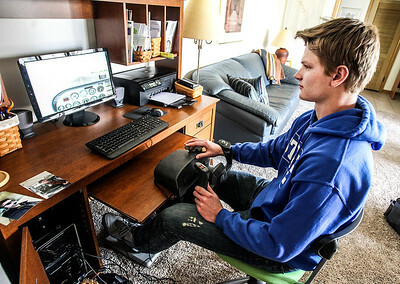 He practices on the simulator three times a week and have 90.5 hours in the air.